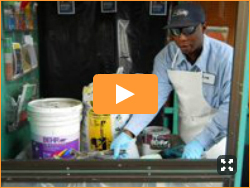 Learn to harden latex paint for disposal in this brief video Youtube. Unwanted latex paint and water-based stains and clear finishes can now be recycled at any Take it Back Network paint recycling location. A recycling fee will be charged for this service. The paint will be sorted, screened and filtered to ensure that it meets strict quality standards. It is then mixed with similar paint colors and tinted to create a recycled paint product. All paint cans are crushed and sent to recycling facilities. The hazardous waste locations DO NOT accept latex paint. If it is not possible to bring your latex paint and water-based stains to a recycling location, latex paint and stains may be put in the garbage for disposal if they have been dried out or solidified first. Dumped illegally, liquid latex paint can be a hazard by plugging or damaging septic fields, overloading sewage treatment plants and creating environmental hazards on the ground. Residents should be using one of the following methods to dry out latex paint and stains. Once the latex paint has hardened or solidified, place the can with the lid off in your garbage container. The garbage hauler needs to see that the paint has been solidified. This only works when an inch or less of paint is left in the can and is most effective in the warmer months. Stir in completely and let the paint dry. It takes about 10 minutes for the cat litter to harden. Add more cat litter if the paint is soft or runny after 10 minutes. Repeat until the material is very thick. Sawdust, dirt, and shredded paper can be tried as alternatives to cat litter. If there is not enough room in the paint can to stir in enough cat litter to dry it all out, pour off paint into any plastic or cardboard container that is large enough to hold the material, including a yogurt container, plastic tub, shoebox, or other convenient container. Mix latex paint or stain with commercial paint hardener according to the directions. At the end of that time, paint will have a tacky, oatmeal-like consistency that will not spill out. Use the paint when painting a garage, dog house or use as a primer coat for another painting project. Donate excess paint to a school, theater group or non-profit agency. Be sure it's latex paint or stain! Look on the label for the word "latex," or for directions to clean up or thin with water. Oil-based paint, solvents and other hazardous products are NOT ACCEPTED at Take It Back Network paint recycling locations. Oil-based paint is hazardous and must be disposed of at one of our household hazardous waste collection sites Businesses in King County can find disposal information for oil-based paint by calling 206-263-8899 or visiting the Business Hazardous Waste webpage. Know how much paint you need before you go to the paintstore. Painting projects require about one gallon of paint to cover 400 square feet of smooth surface. You can save money and avoid waste by getting the right amount of paint for your project. Use this calculator to find how much paint you need for a RECTANGULAR room. Enter the height of the room and the lengths of the shorter and longer walls. Click Calculate to see how much paint to buy. Use this calculator to find how much paint you need for an entire project. One by one, enter the height and length of the surfaces you want to paint. Click the Add to Project button after you enter the dimensions of each surface. The calculator keeps a running total of the surface area for your entire project. NOTE: A rough-textured surface will require more paint than a smooth surface, so if you're on the margin, you may want to buy more.